Amulet Equine Services is the partnership of husband and wife Jack and Lainey McConkey. We strive to provide our clients with a professional and affordable service, with our focus at all times on the welfare of the horse. Lainey is our trainer - see her bio page for more details on her experience - and Jack provides support, whether in assisting with horses or other tasks within the barn environment. It is our firm belief that all horses and riders have their own talents, and it is our job to bring these to their fullest potential. It is equally important that both horse and rider are comfortable within the chosen sphere of riding, and with new partnerships we must work as a team - horse, rider and trainer - to establish which direction is most suited to the partnership, whether it be dressage, showjumping or eventing/cross-country riding. Of course, if a rider simply wishes to improve their riding in order to more fully enjoy trail riding or pleasure riding, that is where we will focus our efforts. The journey is more important, sometimes, than the destination, and improvement of horse and rider is the ultimate goal. Taking part in competitions is a personal decision and will never be pushed if a rider is not competitively inclined. 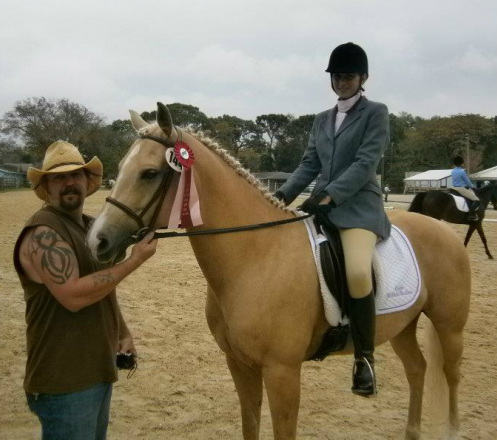 First and foremost, we want to create riders who enjoy their horses and their time riding them.